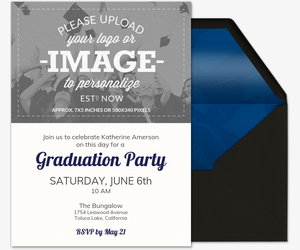 Con-grad-ulate your favorite graduate with an A+ graduation party, starting with grad party invites from Evite. 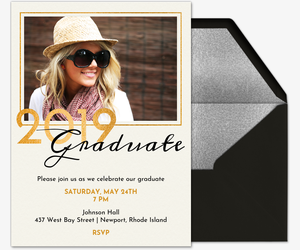 Whether you’re inviting family and friends to the graduation ceremony or to an awesome after-party, choose from dozens of free digital invitation designs or premium online invitation designs, including upload-your-own designs you can personalize with a senior photo or snapshot of the grad. Evite's also the place to get brilliant graduation party ideas, including suggestions on decorations, food and drinks, gift ideas, activities and more. Head over to ideas.evite.com for tons of cheat sheets! Whether the guest of honor is graduating from high school, college, graduate school or even preschool, Evite has the right invitation for you. 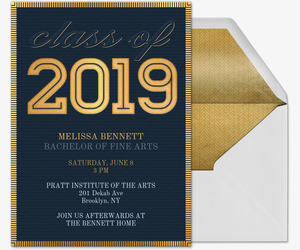 Graduation Congratulations and Thank-You Cards: Turn on the pomp and circumstance – congratulate your favorite graduate in style or thank graduation party guests with a Premium Evite graduation card. Want to send a grad announcement? Check out our upload-your-own-photo graduation card designs and include your grad's name, school and graduation date in the text area. Or send an Evite Thank You Card, located under "Cards" in the top navigation bar, to thank loved ones for gifts, congratulations, and all other help along the way! 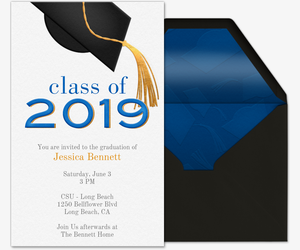 Formal Invitations: If you're marking this big-deal day with an extra-special celebration, you may want to choose a more formal Premium Evite graduation party invitation to match. 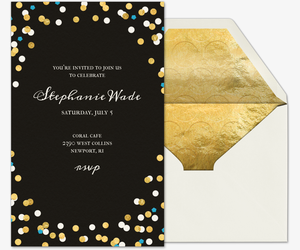 Evite Premium invitations look like traditional printed invitations and come with their own digital colored envelopes with deluxe liners, customizable stamps and no ads. Pricing is based on the size of your guest list ($12.99 for 15 guests, $24.99 for 50 guests and $49.99 for 750 guests). Choose from dozens of designs, from our “Hats Off!” mortarboard invitation to our “Rad Grad” cap decorating party invitation. If you want, you can even upload your own photo or design to a Premium Evite invitation. Casual Invitations:Planning a casual affair to pay tribute to the grad? A free Evite graduation party invitation might be just right. Choose from dozens of invitations for the class of 2018 in the graduate’s school colors, or go for our animated tossing caps invitation. Celebrating a tiny tot? Pick from tons of preschool graduation invitations, like our free “Break out the Bubbly”, featuring blowing bubbles. 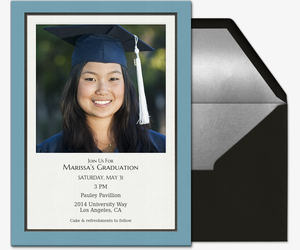 You can also personalize the invitation with the guest of honor’s photo on our upload-your-own invitation templates. Let the experts at Evite Graduation Party Ideas school you on party planning. Study up how to host a best-in-class graduation party with our Graduation Party Guide or our Must-Haves for Every Graduation Party. Or for a fun fiesta, check out our “Taco ’Bout a Future” Graduation Party guide. For some graduation swag, learn how to make festive DIY confetti throwers, money leis, a mortarboard cake stand and other party favors. Watch out real world, here we come!